The fact that anyone can use off-the-shelf components to generate digital wealth stored on a decentralized blockchain is a testament to the power and openness of the PC platform. Cryptocurrency mining quickly caught the attention of two of our veteran engineers, including one who has been studying the field since 2010. They realized early on that conventional motherboards don’t meet the unique needs of mining operations, and they saw an opportunity to connect more graphics cards to a single system. With one of those in-house mining enthusiasts leading the design, we developed the original B250 Mining Expert with support for up to 19 individual GPUs. The board was so ahead of its time that miners couldn’t fully exploit it at first. We had to work with AMD to remove restrictions on the number of Radeons capable of running in parallel before miners were able to realize the board’s potential. Rather than just hopping on the blockchain bandwagon to grab headlines, the B250 Mining Expert made ambitious hobbyist farms more accessible and industrial-scale operations more efficient. It was hugely successful, with a six-figure sales volume that far exceeded expectations. With the concept proven in practice and more insight gained on what miners need, we refined the formula for a second generation. 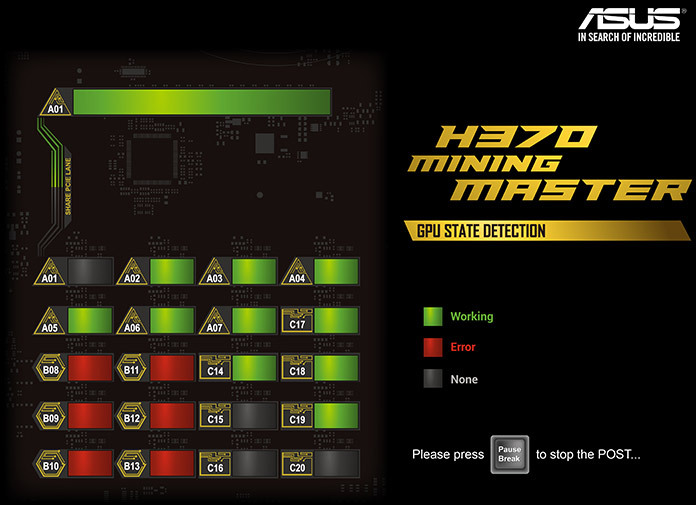 The new H370 Mining Master increases density with support for up to 20 graphics cards, simplifies connectivity by letting USB riser cables plug directly into the PCB, and reduces downtime by making problems easier to diagnose. 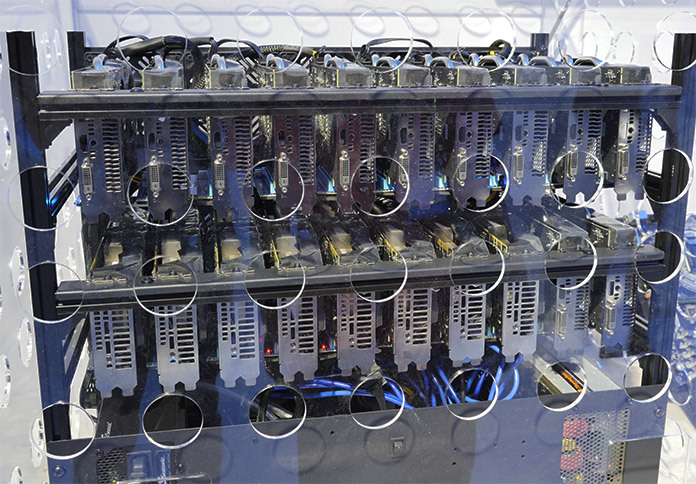 You can see it running at full capacity in a custom mining rig unveiled at Computex 2018 in Taipei, Taiwan. This blockchain behemoth will be at the ASUS booth, #M410 in Nangang Hall, from June 5-9. Mining is a numbers game; it’s only worthwhile if the value of the cryptocurrency you generate exceeds the cost of producing it. Increasing the number of graphics cards per node is a great way to stack the deck in your favor. This allows you to allocate more of your hardware and power budget to the GPUs that create wealth rather than motherboards, CPUs, and other system components that act as the supporting cast. With 12 Radeon RX 470 and eight NVIDIA P104 cards tied to a single motherboard, our demo rig highlights how much horsepower can be harnessed by the H370 Mining Master. The graphics cards are mounted in a special rack built just for this machine by our partners at Cooler Master. Spacing out the cards gives the GPU coolers room to breathe, which is vital when the underlying chips run continuously at full tilt. 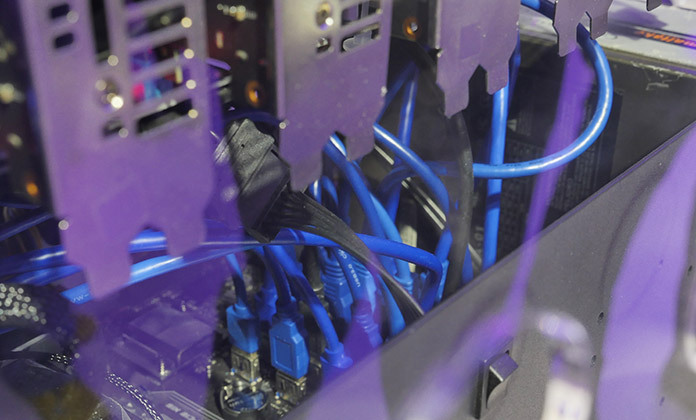 PCIe risers make configurations like this possible by connecting each graphics card to the motherboard with a length of flexible cable. Crunching crypto blocks doesn’t require a lot of interface bandwidth, so each card can get by with a PCIe x1 link routed over USB 3.1 Gen 1 wiring. The risers responsible are typically made up of three pieces: the x16 slot that hosts the graphics card, the x1 card that plugs into the motherboard, and the USB cable that connects them. 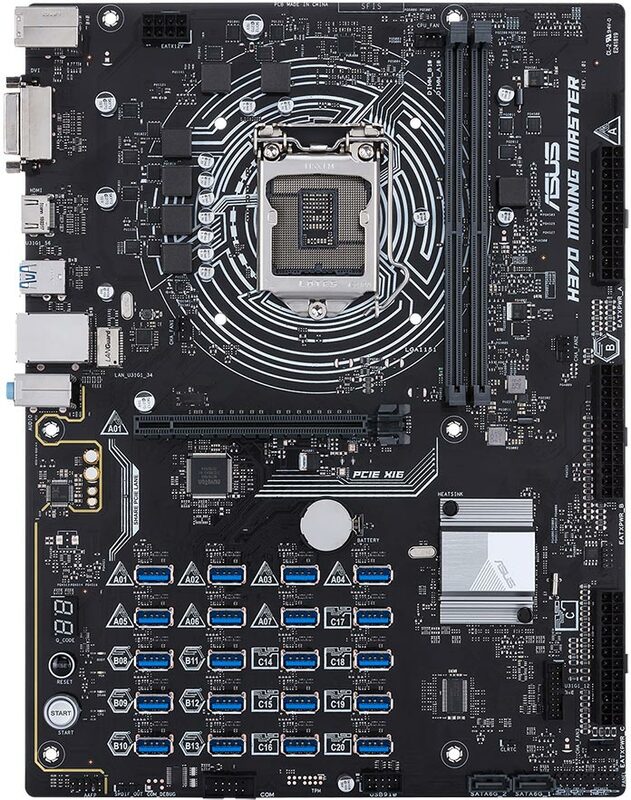 The H370 Mining Master simplifies this chain by replacing its predecessor’s x1 slots with banks of vertical PCIe-over-USB ports that let riser cables plug right into the motherboard. This direct connection is sturdier than using a PCIe card, with less chance of inadvertent disconnects, and it reduces the total number of parts in your farm. Reimagining riser connectivity also cuts down on clutter around the motherboard, which enables cleaner wiring worthy of cross-posting on /r/cableporn. The vertical USB ports are made specifically for riser cards. They’re fed by PCI Express lanes in the Intel H370 chipset, so they’re incompatible with ASIC mining modules that require a true USB connection. We built this board to master the art of mining with GPUs, whose general-purpose computing prowess can chew through new algorithms long before purpose-built silicon is announced, let alone available. One graphics card can also sit in the available x16 slot on the motherboard, but installing it there disables the first riser port, so the maximum is still 20 cards total. It’s not enough to simply build a high-density mining rig; you also have to keep it running smoothly. Less time maintaining your machine means more time mining with it, which is why the H370 Mining Master includes a suite of diagnostic features designed to make your farm easier to manage. Chief among them is GPU State Detection, which scans the system at boot and indicates whether each riser port is empty, connected to a functional graphics card, or experiencing problems. The updated State Detection GUI clearly identifies the location and status of each port along with the alphanumeric code that identifies it. To further streamline troubleshooting, the board will ship with matching alphanumeric labels to stick onto corresponding riser cards. You’ll be able to quickly look at the labels to find flagged GPUs instead of being forced to trace the path of cables connected to affected ports. Onboard diagnostics are augmented by individual debug LEDs that light up when there are problems with specific system components, like the CPU or memory. The two-digit POST code display identifies issues that interrupt the boot process, further simplifying the troubleshooting process, while integrated power and reset buttons make it easier to work with a bare board. Efficient mining requires a few UEFI tweaks that are consolidated in a special Mining Mode. 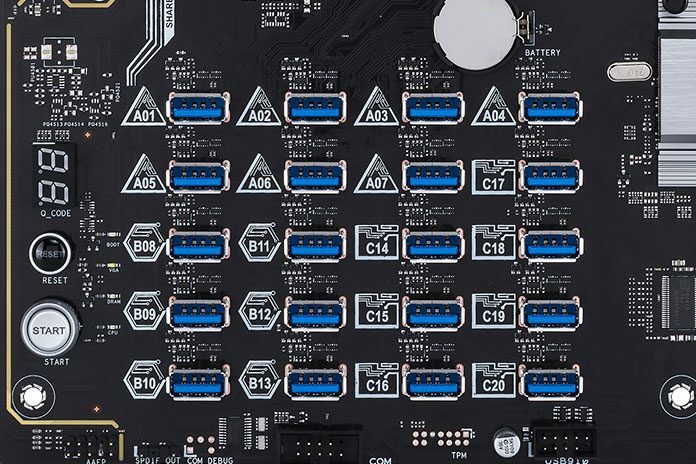 The motherboard’s PCIe lanes are set to run at Gen 1 speeds to improve compatibility and stability with USB riser cards. Above 4G Decoding is enabled, which is critical for supporting lots of graphics cards, and Launch CSM is disabled, which lets the motherboard and graphics UEFIs synchronize with each other. Mining Mode is activated by default, so you’re ready to go right out of the box, without having to mess around in the firmware interface. With a trio of 24-pin primary power connectors, the H370 Mining Master can connect to up to three PSUs simultaneously. Each one is tied to a separate bank of riser ports, allowing you to scale up the number of GPUs gradually and add more power as needed. Some motherboards require modifications and special startup sequences to run on multiple PSUs, but the Master is tailored for the task. All that’s required is for the PCIe power connector on each graphics cards to be plugged into the same power supply as the corresponding riser port. 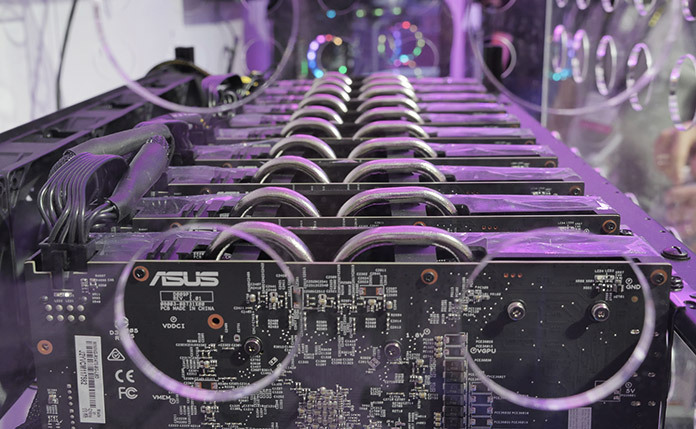 The graphics cards used for mining are typically headless number-crunchers that never connect to a monitor, and some lack display outputs entirely. Traditional display duties are handled by the graphics processor on the CPU, whose signal is piped through graphics ports on the motherboard. The B250 Mining Expert is limited to a single HDMI output, but we got a lot of community requests for DVI, so we added it to the rear cluster on the H370 Mining Master. In addition to broadening support for inexpensive monitors, this upgrade provides native support for dual displays, so you can expand the screen real estate available for monitoring all your GPUs. The H370 Mining Master raises the bar for mining motherboards by letting more graphics cards connect with a simpler interface. It’s slated to be available later this year. If you’re at Computex 2018 in Taipei, be sure to check out the board in our amazing demo rig at the ASUS booth, #M410 in Nangang Hall, from June 5-9.